If your Organization supports Flight Circle Payments, you can use your debit or credit card to pay a flight rental or flight training bill online. 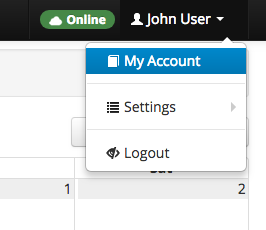 To access your account history, select your name on the top-right corner of the screen and select My Account. When the page appears, a blue button with the test “Make Payment” will be visible if your Organization accepts online payments through Flight Circle. Press “Make Payment” and a popup window will appear. Select “Add Card” on the top-right of the pop-up window and enter your card information, including your card number, expiry, name as it appears on your card, and the card billing address. Once the form is complete, press “Add Payment Method” to return to the Make Payment window. After returning to the Make Payment window, enter the value of the amount you’d like to pay in the Amount field, make sure that Payment Method is set to Card, then select your newly added card from the drop-down menu just below Amount. Press “Make A Payment” to complete the payment and add funds to your personal account. Congratulations! Your payment was successful and has been posted to your Flight Circle account for this Organization. You can now click the blue “Receipt” link for a printable record of your transaction.